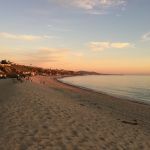 Ask fellow campers about "Doheny State Beach" and nearby attractions. We stayed in what we thought was an oceanfront space, but actually had NO view of the beach or water because of the huge sand berm. Every day a tractor pushed sand higher and higher to protect the park from ocean water surging up and (eventually?) going into the park should there be a storm. The beach was right on the other side of the berm, we just had to climb up and over to get there. The pictures on the park website show a view of the water (from the "ocean front" sites), but it's not so. The train goes by several times a day and also at night, but it doesn't blow the horn or sound too loud. It's dry camping at a clean and relatively quiet park right next to the beach. We enjoyed our stay, but were just a little disappointed we couldn't see the water. We camped at Doheny State Beach in a Motorhome. The bike trails make it easy to ride to Doheny Harbor where there are restaurants and shops. Another CA state beach campground, pretty much just like all the rest. Only providing the basics, and at a high price. Again, no dogs allowed on the beach, as instructed by a rude park ranger guy, but lots and lots of dogs were on the beach that evening, and with no enforcement at all. No sewer at site. No power at sight, so lots of generator noise. Not a whole lot to do if you don't have a tow vehicle with you, as walking distances are considerable. All-in-all, this is the only SoCal state beach campground that earns a rating over a two from us. Mostly due to the fact that they have an actual beach that you can access rather than just cliffs. 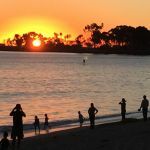 Not a lot of choices for RVers in the area, so if you must... We camped at Doheny State Beach in a Motorhome. Stayed 5 nites. Spacious sites with small shrubs between. Well kept, clean and right on the beach. Lots of families with kids. They are very strict on out by Noon, NOT in before 2PM, and generator rules are strictly adhered to, allowed 10AM to 8PM. Bring your own firewood. The stuff the host was selling was pieces of soft pine, more like lumber cuts. Would stay again and great if you want to be right on the beach or within a few feet of walking to the sand. We camped at Doheny State Beach in a Travel Trailer. Sites are very close together, but if you reserve far enough in advance to get beachfront, you won't mind. There's shrubbery and small trees to add a tiny bit of privacy, unlike Bolsa Chica State Beach a few miles north that is just an asphalt parking lot. Also unlike Bolsa Chica, Doheny beachfront sites are truly right on the beach. Walk your folding chairs a few feet atop the sand berm, and you've got a million dollar sunset view. Sites have tables and fire rings, and are asphalt. There are no hookups, but I still think $60 is a good value because of the location. The beach is beautiful and Dana Point has so much to offer. Whale watching and fishing charters are available at the nearby marina. Loads of restaurants nearby, too. We will definitely return. We camped at Doheny State Beach in a Motorhome. Reserve in advance and get a beachfront site. It makes a huge difference to be able to see and hear the ocean right from your site. If you go fishing or whale watching at the Dana Point Wharf, don't pay full price. 50% off coupons are easy to find. We were across the street from a beach camp site but we sat higher than the tent at that site so we had a great ocean view. We camped at Doheny State Beach in a Motorhome. Lots of nice walking, many nearby restaurants, nearby bike & kayak & paddle board rentals, ocean swimming. Disneyland less than an hour away. Ride the train to San Diego. San Juan Mission close by. Too much to list all. Very fun area! However, we are unhappy that they have shut off the power in bathrooms. You cannot run a shaver or hair dryer. They have also let the grass and many bushes die. In addition, although the campground was at least one-third empty and showed available sites on-line, they posted the campground Full. Even though there were empty sites for the 3 nites we were staying, they would not let us switch sites. They also refuse to let you check in before 2PM, even if your site is empty. They make you wait in the parking lot. Seems like a lot of rules imposed for sole convince of the management. The rangers in charge of this campground sometimes forget they are hosting people on vacation. A little flexibility, like all other State campgrounds we've been to is needed. The power in the bathrooms should be turned on. What right do they have to turn off the power? I don't remember the nightly fee being lowered due to the reduced services! The State needs to replace the management here! We camped at Doheny State Beach in a Motorhome. I got an email that one night opened up for my friend's 70th birthday so I snapped it up. Lovely site right by beach with sound of surf 24/7. Sunset over the marina and sunrise in the east--what more do you want? Bathrooms were clean, all quiet after sunset. We walked with dogs a long way east to see damage caused by recent storms and closure of the day use area due to repairs. We camped at Doheny State Beach in a Motorhome. We just stayed overnight but in the past we kayaked, and went to charming Mexican restaurant on the other side of the tracks. I've been here several times and was never disappointed. Fantastic! You can park a 42 foot Rv and back in hanging the back end on the beach and still be on the concrete pad with your tires! Right on the beach and beautiful! Generators need to be turned off from 8pm to 10am which is strictly enforced but manageable! If you want to camp on the beach this is the spot! Bring your bikes and enjoy! Clean, quiet and beautiful sunsets with the waves breaking 10 feet away from your RV! Good surfing too! Popular site for local surfers! We camped at Doheny State Beach in a Motorhome. We stayed in site # 11 in a 34 ft Class A with slides. We felt very lucky to get this last site when we booked it months in advance, and we were very happy with the park and its proximity to the beach! Our only concern to pass on is the width of this site and a few others in the park. We had just a few inches to spare on either side, had to lift branches to get the slides out, and no room for a tow vehicle to park. Highly recommend this park, but look on the map for sites that show an extra side parking spot if you have a choice. We camped at Doheny State Beach in a Motorhome. Very nice campground, clean, quite for the most part. You can hear the train but is not very loud, at least at our site #63. Had a nice view of the ocean. Park Service employees are always cleaning. Campground is kept very clean, except for people that don't think they need to clean up after their pets. The people in two sites next to us didn't think the generator run hours rules apply to them. Site #61 was going all day on the 17th, they had two small dogs they left in a small cage all day. About 6:00 PM the dogs started barking at everything. Someone showed up around 7:00 PM turn on the porch light started the generator and left. They came back around 9 to shut of the generator. The people at site #121 were also going all day and left the generator running all day, not a quiet one either. Around 10 PM either the generator ran out of gas or someone shut it off. The Camp Host was at both sites around 8:30 PM to get them to shut off the generators but no one was around. Was told by the Camp Host they can't turn off the generators as directed by the Park Service Rangers. All the sites parking areas is asphalt. We camped at Doheny State Beach in a Motorhome. Where else in Southern California can you camp right on the beach! You can have a real camp fire. Ocean is only footsteps away, not down some steep road or path. Highway is not too close, so noise is minimal. Campsites are situated between tall plants so you don't really see your neighbor. Surfing beach is great. Millions times better than Crystal Cove. We camped at Doheny State Beach in a Tent. Great restaurants within walking distance. Fantastic bike trails. Good bird watching. Very clean and wonderful. We only stayed one night so can't really tell you a bunch. It was easy to find and get to. Backing up was a bit tight but then again most state parks are. Overall a great place. We camped at Doheny State Beach in a Travel Trailer. Excellent State Beach Park. Ocean access is easy and great surfing available. Site #19 is 2 rows from the oceanfront, but more than adequate for my 21' rig. Clean restrooms and showers. We camped at Doheny State Beach in a Travel Trailer. Space was nice and level with no hookups or Wi-Fi. The campground sits on the water, with many sites on the beach. The campground also sits next to the train tracks and they run all day and a couple after midnight to early morning. Each camp site has a picnic bench and fire pit. Pet friendly, we were traveling with our 3 cats. The camp host was not the most friendly or helpful person....maybe was having a bad day. Had asked for some help or info re: our dead battery and basically ignored us. Other Camper helped. We will go back here to stay again. The beach is beautiful. We camped at Doheny State Beach in a Motorhome. The current budget crisis in CA has really driven up the prices, but this is still a very nice beach campground. No hookups of any kind, but the beach views are great. 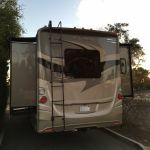 Note though that if you pull into one of the beach side sites in a motorhome that your door will be on the wrong side and you will step out into your neighbors site. Backing into a second row site will give you a view out of the front of the rig, and put your living space on the correct side of the rig. One other note, the dump station can be very tight so pull in carefully. I would stay here again. We camped at Doheny State Beach in a Motorhome. 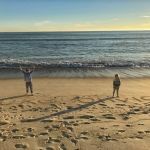 Are you affiliated with Doheny State Beach ?